Making your way to Barcelona, but find yourself unsure as to which area of the city best suits your vacation needs? Since the Catalan capital has endless array of beautiful districts, all with different, yet equally fantastic qualities, this is definitely one of the toughest decisions to make when choosing your apartment in Barcelona. 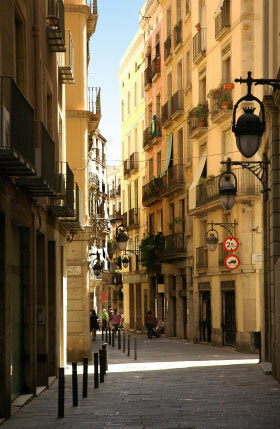 To help you along, we’ve composed a list of five top neighborhoods ready to become the base for your trip to Barcelona. Scattered across the city, each area brings something unique to the table, while allowing you to make the most of your visit to this wonderful city. Fancy losing yourself in medieval Barcelona? The Barri Gòtic, situated in between El Raval and El Born, offers guests a first-hand experience of the rich history on display in this bustling city. Characterized by small, picturesque alleyways and beautiful Gothic architecture, renting an apartment in the Gothic Quarter will surely transport you back in time. The neighborhood is home to plenty of tourist attractions including the Catedral de Barcelona, Plaça Reial and the government palace of Catalonia, offering the perfect escape and the ideal locale for a true taste of Barcelona culture. Prefer spending your time soaking in the Mediterranean sun? Barceloneta offers its temporary inhabitants proximity to the coast and magnificent sea views, while remaining close to the main attractions of the city. With the additions of nearby Port Vell and Port Olímpic, this area has become a popular spot for tourists who wish to spend their time close to the beaches of Barcelona. The beachfront, lined with ‘chiringuitos’ (beach bars) and amazing seafood restaurants that are best known for their outstanding paella, offers a unique escape from regular citylife. 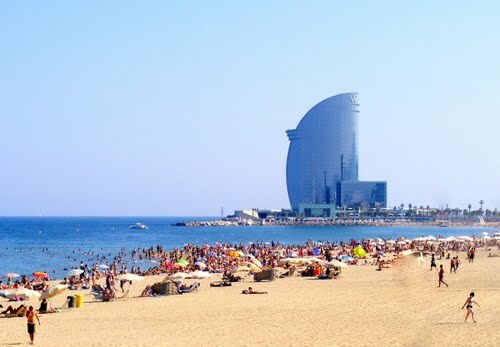 With easy access to the shore, it should come as no surprise that this area is filled to the brim during the summer months, as tourists get comfortable in one of the many beach apartments in Barcelona. Consider yourself a Gaudí fanatic? 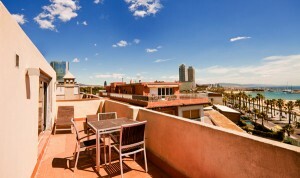 If so, there is only one option for the location of your trip to Barcelona: Eixample. This area of Barcelona is home to some of the most famous sights in Europe including the towering Sagrada Familia, known as Gaudí’s unfinished masterpiece. Being one of the very first extensions from the main city square, Eixample plays host to some of the most revered attractions in Barcelona, so it should come as no surprise that this area is a favorite amongst tourists. The zone is actually split into two different districts: Eixample Izquierdo and Eixample Derecho, each one with its own array of fantastic restaurants, breathtaking monuments and shopping highlights, such as the famous Passeig de Gràcia street. With both Casa Batlló and Casa Milà (La Pedrera) further decorating this architectural hotbed of a neighborhood, choosing to stay in one of the many Eixample apartments in Barcelona will leave you surrounded by the best that this city has to offer. One of Barcelona’s oldest neighborhoods, El Born (often referred to as La Ribera), welcomes visitors with fashionable boutiques, quirky bars and enticing museums, sure to satisfy temporary residents of all ages. This area offers endless opportunities for tourists to immerse themselves in Catalan culture, and is home to some of the city’s most famous attractionssuch as the Picasso Museum. You will also find the renowned Palau de la Música Catalana just a few minutes walk away as it is situated in the nearby ‘barrio’ of Sant Pere. Another celebrated sightseeing spot is the Santa María del Mar basilica, a beautiful Gothic church. By choosing an apartment in El Born, you will be sure to enjoy the best of both worlds: a longstanding display of history alongside an urban zone bursting with life. 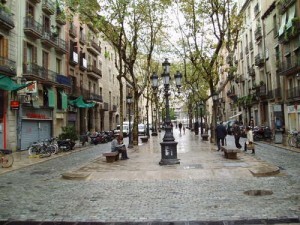 Situated at the end of Passeig de Gràcia, you will find a quaint town with a distinctive Catalan atmosphere. An upscale neighborhood where local flair is abundant, Gràcia is home to many charming restaurants, locally-owned boutiques and some of the best luxury apartments in Barcelona. However, with plenty of local students and young residents, this area comes alive at night, with a bar scene that remains trendy, but wholesomely Catalan. This beautiful town is situated just outside the city center, providing you with a more tranquil vacation spot, while remaining near to all of the main attractions in Barcelona. Gaudí’s renowned Parc Güell is in close proximity to the neighborhood, so choosing to stay in a Gràcia apartment will leave you with astonishing views of Barcelona right on your doorstep. From the sunny Barceloneta beach, to the trendy Gràcia district, to the quaint El Born area, Barcelona offers many wonderful neighborhoods to cater to your every need and desire. One thing is for sure, whether you have a busy sightseeing schedule or a relaxing vacation planned, having a comfortable place to call home should certainly by a priority for your trip. Book your Barcelona apartment today, and dive into the endless activities on display in this beautiful city!